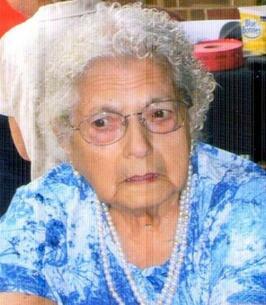 Ruby Mae Cogar Lake, 85, of Alum Bridge, WV went to meet the Lord on Saturday, November 3, 2018. She was a housewife, mother, grandmother and worked as a cook at the Caravan Restaurant in Weston. She was born in Webster County on September 7, 1933: daughter of the late Bernard and Alma (Simons) Cogar of Webster County. She was preceded in death by her husband: George C. Lake, two daughters: Mary Lake and Milly Harrison Queen, two sons: Bernard Carl Lake and Sammy Joe McCartney, one son-in-law: Jackie Lamb, 3 grandchildren and five sisters: Shirley, Lovie, Lilly, Nettie and Minnie. Mrs. Lake is survived by one daughter: Geneva G. Lamb of Alum Bridge, two sons: George (Kathy) Lake and Micheal (Wanda) Lake both of Camden, one step son: Clyde Harris of Turkey Run, Buckhannon, one step daughter: Thelma Williams of Jane Lew, 13 grandchildren, and many great and great great grandchildren. Siblings still surviving are two brothers: Bernard Cogar, Jr. and Teddy Cogar both of Weston and one sister: Geraldine Casto of Buckhannon and several nieces and nephews. Ruby was a Baptist by faith and was a member of the Rock Grove Baptist Church with Pastor Ben Hall. Her hobbies included cooking, sewing and canning. Family and friends will be received at the Hardman-Paletti Funeral Home 730 N. Main Avenue Weston on Tuesday, November 6, 2018 from 4-7 p.m. Funeral services will be held on Wednesday at 1:00 p.m. from Hardman-Paletti Funeral Home chapel with Pastor Ben Hall officiating. Interment will follow services in Forest Lawn Memorial Gardens of Jane Lew, WV. On-line condolences and life stories in memory of Ruby may be expressed at hardman-palettifuneralhome.com. In lieu of flowers donations may be made to the Children’s Miracle Network 1 Medical Center Drive Morgantown, WV 26506. To send flowers to the family of Ruby Mae Lake (Cogar), please visit our Heartfelt Sympathies Store. What a wonderful wonderful lady. Miss the good old days and all of the family.